Major Fredric Arnold devoted his life to helping people appreciate the incalculable human cost of war. His monument to the US Airmen killed in WWII was his way of communicating that terrible loss. It was fitting that he passed away on May 28th, 2018… Memorial Day. He dreamed to see two of his sculptures exhibited to the public, one in Denver, the other in New Orleans. Your tax-deductible contribution will help support Major Arnold’s dream. Please make your donation by sending a check or simply use the button below to donate to the project by credit card. “Lest We Forget: The Mission” is a sponsored project of Fractured Atlas, a non-profit arts service organization. Contributions for the charitable purposes of “Lest We Forget: The Mission” must be made payable to Fractured Atlas only. See below for information about Fractured Atlas. Contributions of any amount are gratefully accepted. Every bit helps! Donations above $250 receive acknowledgement gifts which vary depending on Award Level. Any contribution above the value of the corresponding gift is tax-deductible to the extent permitted by law. If donating $1,000 or more: Whether contributing by check or credit card, your donation must be accompanied by a “Major Donor Letter”. You may email us using the Contact Us button above to receive a blank copy of this transmittal document, or simply click MajorGiftLetter to download a pdf copy, then return the completed form via email addressed to info@LestWeForgetSculpture.org. If you wish to make a major tax-deductible donation by sponsoring one or more of the twelve life-size bronzes, please use the Contact Us page to get in touch. I had the supreme pleasure of helping Dad during the last years of his life. His drive to honor the airmen killed in WWII was awe inspiring. When people sometime referred to the airmen who “died” in the war, he would gently correct them, “they didn’t just die, they were killed”. He bore the deep emotional scars of seeing and participating in the horrors of war first hand. I believe his passion for the project was a way for him to atone for his necessary but deeply regrettable role in that global melee of wanton destruction. The message of peace is timeless. Thank you for helping Dad communicate his message to future generations. The finished sculpture is now on display at the Wings Over the Rockies Air and Space Museum in Denver, Colorado. When preparations are complete, we hope to move the sculpture to a special exhibition location at the National WWII Museum in New Orleans. Whether we can cast a second bronze and make both locations permanent exhibitions depends on public support. Thank you again for your interest. As word of Dad’s project gets out, Dad is constantly amazed and humbled by the outpouring of support. Fractured Atlas is a 501(c)(3) public charity. Contributions for the purposes of Lest We Forget: The Mission are tax-deductible to the extent permitted by law. For those who are able to consider a contribution at the highest award level (“Fighter Pilot” Level at $10,000), we have created a very special recognition award. Donors of $10,000 receive a Special Limited Edition “Table Top TEENAGER” mounted on a walnut base suitable for home or office. Each sculpture’s edition number (1-50) ties it to a specific combat mission flown by Major Arnold as evidenced by a Certificate of Authenticity which references the specific mission as documented in Fredric Arnold’s 1943 logbook. A photocopy of the logbook is included which depicts all 50 combat missions, a rare artifact given that early in the war, only a small fraction of pilots stationed in North Africa survived 50 missions and returned from combat. Eight inches tall, “Table Top TEENAGER” is a small version of the life-size “TEENAGER” (figure number one of the twelve life-size figures that comprise “Lest We Forget: The Mission”). 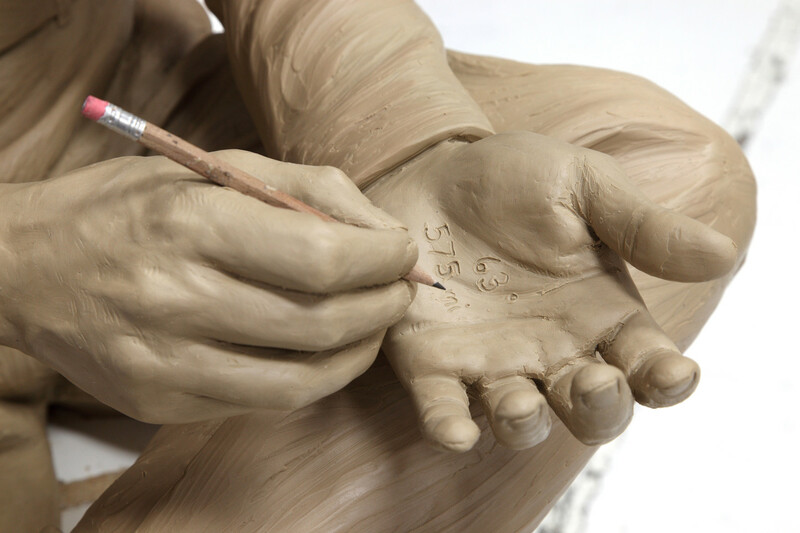 Each of these bronze sculptures is individually numbered, signed and reserved as a gift to major donors. None will be sold. The edition size of 50 commemorates the fifty combat missions flown by Major Arnold during WWII. Thank you for your service – both in the war and in peace – and especially in producing this poignant memorial to your lost comrades, and to some extent, all the other brave men and women who served and died in your war and others. My father and uncle served in WW II (both Marines), and I also served, though in a later war (Vietnam) as a “mud Marine.” All of us were engaged in close personal ground combat. Like you, I know the true “cost of war” for all involved, and I also wish with you that all nations, creeds, and people could learn to settle any supposed differences peaceably. Sadly, we seem to be as far as ever from that noble aspiration. But we who know the true price must continue to try to spread the word. To that noble end, I contribute what I can, and will alert all in my circle of comrades, and family and friends, to your project, in hopes that the remaining funding can be obtained. If you have the opportunity, I invite you and your family and friends to view the website I have established as a memorial to my comrades of CAC Oscar (see att.). With your permission, I will be linking your story and site to ours in the hope of sending any traffic to our site to yours as well. My father was touched and asked me to thank you for your kind and thoughtful comment. I can’t begin to express my feelings to you. It is simply overwhelming! It will take me a while to really be able to digest all of what happened yesterday. I can only imagine what is must be like for you. Any good work of art creates thought and emotion. Your Dad’s incredible sculpture transcends this and brings it to a new, rare and unique level. It will continue to affect people of all ages for years to come. I offer you my sincere thanks for all of the work that was necessary to complete this fabulous task. I hesitate to use the term monumental as that doesn’t begin to describe this task. You have done a terrific job! Yes, please feel free to post links to our website wherever you think readers might be interested and thank you for your support.